The arrival of the smartphone at retail continues to raise a thorny question over who owns that digital experience in-store. The retailer? Third-party deal aggregators and comparison engines? When it comes to food shopping, the couponing sites and grocery stores have a distinct advantage over mom’s smartphones. Packaged goods brands? Not so much. The good news for the grocery supply chain is that 4 out of 5 moms with smartphones use these devices either before or during the grocery shopping experience, according to the latest survey from location analytics company Placed. Using its panel of over 125,000 opted-in app users and over 5,000 questionnaire respondents, the company determined a high level of app use among moms who are food shopping. About 47% of moms with smartphones use them to make a shopping list before going to the store and 40% are actually using them in-store. About the same numbers of moms are also using smartphones to find or access coupons in pre-shopping mode (45%) or in the store (40%). Slightly less than 40% are using phones for recipe lookups before shopping, and just under a third are referencing recipes while food shopping. And while price comparisons are a dominant mobile activity in some other product segments, for food, less than a third of moms with smartphones are using them this way. Perhaps the most interesting finding in Placed’s review of food shopping smartphone-wielding moms is how they prioritize their deal sources. When asked where they prefer to access coupons on smartphones while in the store, 29.3% cited a dedicated couponing site or app. Another 28.8% preferred visiting the grocery store’s own site or app. And almost as many (27%) favored scanning QR or other scan codes to get the deal. A miniscule 5.3% said they most favored going to the product brand site or app. The study suggests that retailers and dedicated coupon sources are far and away top of mind as go-to sources among smartphone users. Placed found that these preferences vary according to retailer, however. Kroger and Safeway customers were more apt than average to reference the grocery store brand on their phones over both coupon sites and brands. 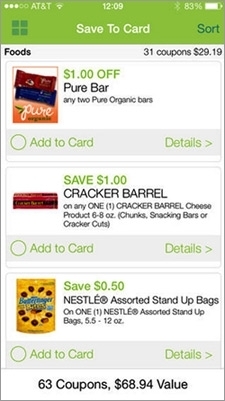 Publix shoppers were more likely to scan a code or use a coupon site. This suggests a certain malleability of smartphone habits, perhaps according to the reputation and availability of a retailer’s own mobile resources. In analyzing actual traffic to dedicated grocery stores, Placed found Kroger’s was by far the most popular venue, attracting 13.7% of the sample. Aldi (6.5%), Safeway (5.6%) and Publix (5.6%) followed the leader in terms of overall reach among smartphone moms. Specialty grocery stores like Whole Foods (1.9%) trailed the rest. But it was the dollar-store type of venue that had the strongest overall allure to these moms, with Dollar Tree attracting 22%, Dollar General 13.9% and Family Dollar 12.2%. 3 comments about "In-Store, Moms Look To Coupon, Retailer Sites, Ignore Brands". Sarah Radwanick from Placed, January 8, 2014 at 11:15 a.m.
will lee from erwin penland, January 8, 2014 at 4:53 p.m. Interesting article and stats. However, we have to remember that adoption and deployment of more sophisticated POS systems across grocery chains using legacy IT systems and registers that can read codes, and the needs for coupon code security, are both lagging behind other types of trade. Shoppers largely need to "load savings" onto existing loyalty accounts for auto redemption at a store - something Kroger does very well. In-store efforts for brands that work with Grocers, developing thoughtful shopper marketing, are still effective and should not be left behind for programs that are just about savings/discounts when spending trade and marketing dollars. Steve Smith from Mediapost, January 8, 2014 at 5:06 p.m. Thanks Will. Look for my Mobile Insider column tomorrow for a tale of frustration involving a grocer who appears to have some of the most sophisticated POS systems installed. Evwen when the tech is in place and the consumer is savvy and willing, this isn't ready for prime time.